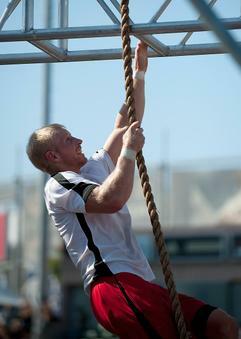 The CrossFit Games are the proving grounds for effective fitness methodology. From workout programming to recovery techniques, if something makes you fitter it can be validated by the results of the Games. Unfortunately, as with all statistics, the data from the Games does not always immediately lend themselves to conclusions. CrossFit competition is still in the early stages of development, and we do not have full access to the methods used by the competitors. Nonetheless, it is possible to glean some insight from the results. Jeff Barnett, CrossFit Impulse, has taken one shot at interpreting the data we have from the CrossFit Games. Barnett decided to compare the competitors' self-reported workout performances from before the Games with their results at the 2010 CrossFit Games. While we have not yet vetted Barnett's statistics, he reaches some interesting conclusions about the interplay between athletes' training results and their performance at the Games. Download Barnett's full article as MS Word HERE. Download Barnett's full data set as XL HERE. Download Barnett's analysis as XL HERE. I am extremely impressed with the analysis. Thank you! I am curious whether the conclusions hold up when you separate the athletes into two groups, those who were cut and those who were not. We can look at Games as two separate competitions, the part that included all the athletes, and the part that included only those athletes who survived the cut. To make a analogy, there are certain skills that might be critical for getting into college but not for getting through college. That is, those who make it to the next level all share a common set of attributes that are not necessarily as common in the larger group applying for admission. 11 October 2010 / 10:18 a.m.
Great point. I agree that the results might be very different if I only included athletes that made the cut. However, the conclusions would be even more fast and loose because of the limited data set. 43-45 data points carry some statistical significance. 24 data points--much less. 16 data points--very little. I suppose my assumption was that the regional events that fed the final competition were also thorough tests of overall fitness. I am sure that varied from region to region, and probably introduced some variance into the results. 11 October 2010 / 10:42 a.m.
One possibility that uses all the data would be to run the analysis using the standings prior to the cuts. My guess is that this would attenuate or eliminate the unexpected inverse relationship between endurance and standings among the men. 11 October 2010 / 11:53 a.m.
Oooh, now that's an idea! I'll take a look at how much effort is involved in reconstructing the standings before the cuts. However, I'd also want to examine the difference in standings from pre-cut to final. If they are significantly different then we've just traded one bad assumption for another. 11 October 2010 / 12:13 p.m. So, perhaps it makes sense to determine the correlations with the totals used to determine the standings as opposed to the standings themselves. For example, a hypothetical athlete who was a distant 16, far behind number 15, might turn in a very strong performance on the final day, but move up only slightly. Finally, I think that the test you describe would be best run by comparing the standings of the final 16 before the cuts to their relative standings based on only the subsequent events. 11 October 2010 / 12:56 p.m.
Hari, I ran the numbers on the men comparing pre-cut placement and final placement. The two placements are almost identical. Then I ran a correlation analysis using the pre-cut placement. All of the variables were very similar, including the inverse correlation with endurance. Looks like that was a dead end. Your further explanation might yield something interesting if implemented, but I'll leave that one to you. 11 October 2010 / 1:02 p.m.
Not a dead end at all. It further validates your conclusions. 11 October 2010 / 1:12 p.m.
Hey, I'm not sure if anyone else is having this problem. I'm on a Vista machine with IE 8 and when I hover my mouse cursor over the hyperlinks, I can see URLs for the Word and XLS files. However, when I click to download, I get sent ZIP archives that include numerous XML and other files that I can't open. Help! I'd love to see the data. 12 October 2010 / 9:09 a.m.
Catlyn, try hovering over and then right-click, save as (or save target as). 12 October 2010 / 8:17 p.m.
Jeff, Very interested to read your analysis, but I can't get it either (tried method you described). Help? 13 October 2010 / 11:04 a.m.
How does the order of the exercises come into play? For example, can one use these results to predict outcomes of a contest that uses a different exercise order? 13 October 2010 / 2:26 p.m.
Justin, the assumptions of this analysis don't allow for order of exercises to be examined. I can't think of a way you could analyze that statistically without volumes and volumes of data (many years of the CrossFit Games). 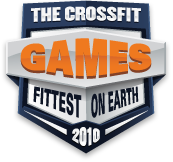 20 October 2010 / 6:46 a.m.
(1) no athlete can compete in CFG2011 if they have not reported their scores for a TBD list of named WODs. No score reported means disqualified at start of CFG2011. The goal being to have measure by which to gauge/predict fitness. It would also fill in the various holes in the analysis you presented; although, maybe those who did not report a named WOD score never had a chance in the first place? 26 November 2010 / 7:04 p.m.